The Memorare is a prayer reminding us that we have a powerful advocate in the Blessed Virgin Mary, whose son Jesus listens to his Mother's intercessions on our behalf. This special prayer invites and encourages us to ask our loving Mother for her help in our times of anxiety and distress and for particular needs and graces for our family and friends, especially those for whom we pray for a conversion or a return to the faith. Never before has our Catholic Faith faced so much opposition from the aggressive secularism and pressures of an increasingly materialistic society which seek relentlessly to push God to the outer margins of our consciousness. 'What relevance does faith or religion have in our modern lives?' seems to be a common refrain. As a result, many of us have family members and friends who have drifted away from the practice of their faith, or may never have had any belief in God. Never before has the need been so great for us to pray earnestly, constantly and with hope for those we love, for the conversion of their hearts and minds to the enduring values of the Gospel which alone show us 'The Way, The Truth, and The Life - the Way that leads to true peace, happiness and eternal salvation. 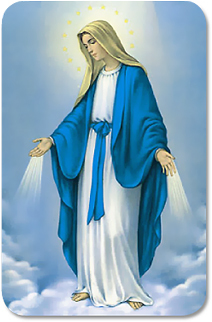 Here we invite you to join us in spreading devotion to Mary by reciting the Memorare every day, by wearing or carrying a blessed Miraculous Medal as well as saying the Novena of the Miraculous Medal. Proof of the power of these devotions to heal body and spirit has been well documented elsewhere but few stories are as dramatic or inspiring as that of the miraculous conversion of Alphonse Ratisbonne in Rome in 1842. Such a moving story of God's grace and Mary's loving intercession provides us with a powerful stimulus to pray, and our hope is that others who may not have heard the story will be equally moved by it and so be encouraged to make these beautiful prayers a part of their daily lives. United in prayer to Our Lady, asking for her intercession for those who can be difficult to reach in matters of faith, our growing community of prayer can hope that her pleas on our behalf will be answered with the graces we seek. In addition to your prayerful support, it would be wonderful if this devotion could be extended further afield through your efforts. To this end the leaflet ‘Miracle of the Memorare’ PDF is available. There is additionally a separate leaflet for the Novena of the Miraculous Medal PDF If you are able to do so please make copies of each and distribute them to your family, friends and members of your church community. With many thanks and blessings for your support and the assurance that we are united with you in prayer. "Prayer is powerful beyond limits when we turn to the Immaculate Mother who is queen even of God's heart."